strict warning: Non-static method view::load() should not be called statically in /home/healthcarehands/public_html/globalhealthtravel.com.au/sites/all/modules/views/views.module on line 879.
strict warning: Declaration of views_plugin_style_default::options() should be compatible with views_object::options() in /home/healthcarehands/public_html/globalhealthtravel.com.au/sites/all/modules/views/plugins/views_plugin_style_default.inc on line 25.
strict warning: Declaration of views_plugin_row::options_validate() should be compatible with views_plugin::options_validate(&$form, &$form_state) in /home/healthcarehands/public_html/globalhealthtravel.com.au/sites/all/modules/views/plugins/views_plugin_row.inc on line 135.
strict warning: Declaration of views_plugin_row::options_submit() should be compatible with views_plugin::options_submit(&$form, &$form_state) in /home/healthcarehands/public_html/globalhealthtravel.com.au/sites/all/modules/views/plugins/views_plugin_row.inc on line 135.
strict warning: Declaration of views_handler_field_user::init() should be compatible with views_handler_field::init(&$view, $options) in /home/healthcarehands/public_html/globalhealthtravel.com.au/sites/all/modules/views/modules/user/views_handler_field_user.inc on line 48.
strict warning: Declaration of views_handler_argument::init() should be compatible with views_handler::init(&$view, $options) in /home/healthcarehands/public_html/globalhealthtravel.com.au/sites/all/modules/views/handlers/views_handler_argument.inc on line 745.
strict warning: Declaration of views_handler_filter::options_validate() should be compatible with views_handler::options_validate($form, &$form_state) in /home/healthcarehands/public_html/globalhealthtravel.com.au/sites/all/modules/views/handlers/views_handler_filter.inc on line 589.
strict warning: Declaration of views_handler_filter::options_submit() should be compatible with views_handler::options_submit($form, &$form_state) in /home/healthcarehands/public_html/globalhealthtravel.com.au/sites/all/modules/views/handlers/views_handler_filter.inc on line 589. Until something goes wrong, we forget how much we depend on our backs. Ordinary back pain is bad enough. But severe pain of the kind sometimes caused by conditions like disc herniation (“slipped disc”) or lateral spinal stenosis (“pinched nerve”) can be completely debilitating, making it impossible to move or walk without severe pain. When you’re in that kind of pain, it’s an extra blow to be told you have to wait months, maybe years, to get it fixed. Yet that’s just what it’s like for Australians who suffer from these spinal conditions. You can wait for months just for an appointment with a specialist in the public health system, and years for the actual surgery. Even if you take out private health insurance, you’ll be looking at a 12 month wait for surgery, as your back problem will be considered a “pre-existing condition”. So unless you have the many thousands of dollars it would cost to pay for the surgery out of pocket, you’re left to wait and to put up with constant pain. Fortunately, there’s a solution for those who just can’t wait, who refuse to put up with a condition that destroys their ability to live an active life. That solution is to have spine surgery overseas, with no waiting, at a fraction of the cost you would pay in Australia. At the Spine Institute at Bumrungrad Hospital in Bangkok, Thailand, patients not only save money and eliminate waiting time; they also have the benefit of one of the world’s most advanced spine surgery facilities. Patients with disc herniation or lateral spinal stenosis can benefit from endoscopic spine surgery, the least invasive kind of spine surgery possible. In endoscopic spine surgery, a small, tubular instrument called an endoscope is inserted through an only 8mm long, allowing the surgeon to see any abnormalities around your back. Other medical instruments are then inserted through the endoscope, so only a single incision is needed. The benefits of endoscopic spine surgery over traditional spinal surgery are huge. Apart from the very small incisions, endoscopic surgery takes less time to recover from. There’s less pain, less risk of infection, less damage to surrounding tissue, and a lower cost. The Bumrungrad Spine Institute features some of the world’s best, most experienced spine surgeons. 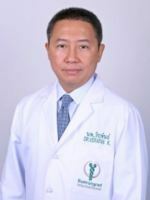 For example, Global Health Travel customers rave about Dr Verapan Kuansongtham , a surgeon who inspires confidence and puts patients’ nerves at ease from the minute they walk into his office. One Global Health Travel patient to benefit from endoscopic spine surgery in Thailand is Herbert from Melbourne. Now retired, Herbert spent his working life in the building industry. So on the one hand, he was used to an active lifestyle, but on the other hand, decades of lifting heavy objects like 20 litre paint drums had taken their toll on his back. In particular, a pinched sciatic nerve had been causing Herbert severe pain for 6 months. Unable to walk more than 100 metres, or to indulge his love of playing golf, he was facing a wait of several months just to see a back specialist. So Herbert decided to look into having spine surgery overseas. Herbert’s daughter-in-law had experience of being treated in a Bangkok hospital, so Herbert and his family already knew about the high quality of medical care available in Thailand. After researching his options with Global Health Travel’s help, Herbert settled on Dr Verapan at Bumrungrad Spine Institute. Dr Verapan put Herbert at ease straight away. Herbert was especially impressed with the doctor’s honesty: he had several back problems, and Dr Verapan didn’t promise to fix them all, but he did recommend surgery for the problem that was most severely affecting his lifestyle: his pinched sciatic nerve. We spoke to Herbert five weeks after his surgery. The pain from the pinched nerve is completely gone. He’s now walking again and working on building up the muscles that had deteriorated while he was incapacitated with pain. Within 6 months, Herbert is confident he’ll be playing golf again. Herbert’s main reason for having his spinal surgery in Thailand was the lack of waiting time – but he also saved a great deal of money. He was out of pocket by approximately $20,000 – a fraction of what he would have paid for the same procedure in Australia. Herbert says he would do it all again. “In Australia, I didn’t have hope that anything would be done”. Spine surgery in Thailand gave him that hope.